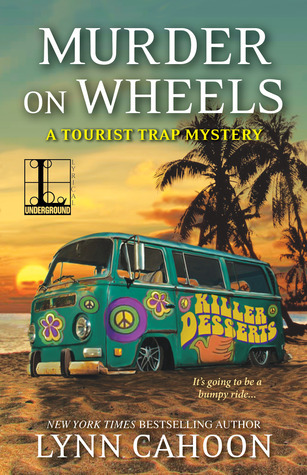 The food truck craze has reached the charming coastal town of South Cove, California, but before Jill Gardner—owner of Coffee, Books, and More—can sample the eats, she has to shift gears and put the brakes on a killer . . .
Now that Kacey Austin has got her new gluten-free dessert truck up and running, there’s no curbing her enthusiasm—not even when someone vandalizes the vehicle and steals her recipes. But when Kacey turns up dead on the beach and Jill’s best friend Sadie becomes the prime suspect, Jill needs to step on it to serve the real killer some just desserts. I was a little confused about why we were requested to review this book since it has NO, and I mean none, nada paranormal attributes. But if the "Charming" mystery series by Tonya Kappes became "normal" I think this is what it would look like. The main character, Jill, is a likable young lady who owns a book store with coffee and desserts and her main squeeze is an officer of the law in the same town. Jill finds herself unable to stay away from investigating local crimes and murders even though she tells herself she needs to step away and let the authorities handle the case. Nice rainy day lighthearted mystery. Likable characters with no paranormal attributes (Do they have those kind anymore?!). Not "spell-binding" but you find yourself engaged in Jill and her co-hearts' lives as you would your funky neighbors. Neighborly gossip and friends in the right places just make Jill a perfect person to assist in closing this murder case. Of course she finds herself in a bit of a pickle and at crossroads with friends which require rescuing by her cutie policeman boyfriend. A very benign and proper romance is included but if you're looking for steamy scenes...look elsewhere. It's not what this story is about. I did enjoy the journey and I think this series could be used like you use coffee beans to clean your palette between aromas...to clear your mind of heavier, darker and more stressful reads. CahoonPersonal stuff? I’m a breast cancer survivor. I’m married to my own hero who shaved his shoulder length hair when I lost mine during chemo. I’m the proud mom of a computer engineer (although I don’t know what that means.) And I have two fur babies.